If you’ve experienced tooth loss, you know what kind of effects it can have on your self-esteem and oral health. You no longer want to smile for pictures, and you might even try to avoid many conversations for fear of someone noticing the gaping hole in your mouth. If you want to do something about your tooth loss, maybe it’s time to try dental implants in Longmont. Using a titanium post, a dental implant acts like the root of your tooth, anchoring into the jawbone to secure your tooth in place. Once the implant is placed, it will begin to fuse to the bone over the span of a few months. Once you are fully healed, your implant dentist in Longmont will provide you with a customized crown that will stop on top of the implant. Its shape and color are modified to blend in with the rest of your smile, making it unnoticeable to others. When Should I Have My Tooth Replaced? The moment you lose your tooth, call and schedule an appointment with your dentist to discuss the possibility of dental implants. The longer you wait, the more damage you can cause to your jawbone, nearby teeth, and overall oral health. If you wait too long and the jawbone has deteriorated, there may not be enough stability for a successful implant procedure. At this point, your dentist may suggest a bone graft before undergoing tooth replacement treatment. Why Should I Have It Replaced? Stop bone loss. When a tooth falls out and the socket remains vacated for an extended period, the bone can begin to deteriorate because of the lack of stimulation. It is no longer working to hold up a tooth, which it needs to maintain its strength. 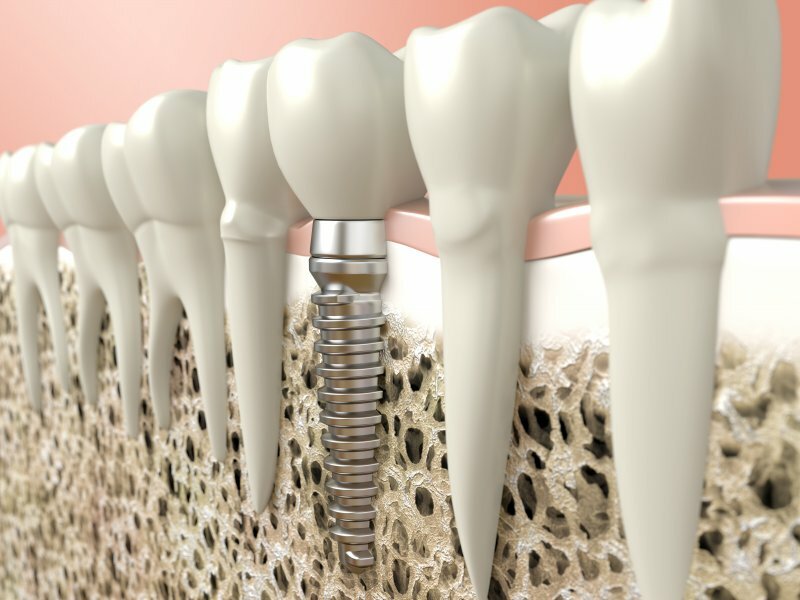 Since an implant acts just like a tooth root, it will give the bone the stimulation it needs to stay strong. Keep teeth from shifting. Any natural teeth that sit next to an open socket may begin to shift inward to fill the gap. This can cause misalignment issues and even cause nearby teeth to become loose and eventually fall out. Dental implants keep your natural teeth in place. Prevent issues with chewing. Because your bone can deteriorate over time, the overall shape of your jaw bone will be affected, which means you may have trouble chewing and biting. Dental implants restore your jawbone’s natural shape, and any bone resorption will discontinue. Help you maintain your appearance. Too many missing teeth can cause your facial appearance to change. Don’t want a sagging face? Make sure to talk to your dentist about dental implants. Once in place, your cheeks will no longer look hollowed out, and essential nutrients will once again travel to your face because of your tooth root replacement. Don’t wait to do something about those vacated areas of your smile. Talk to your dentist about treatment options, and give yourself the opportunity to regain your smile and your oral health. Are you looking for an advanced solution to replace missing teeth? At Longmont Complete Dentistry, we use advances in modern technology to give you a healthy, fully restored smile. Dr. Dan Maurer and his father, Dr. James Maurer, know the importance of good oral health, and they know how much it means to you. Therefore, you can expect a dedicated team of professionals to provide you with personalized care and treatment options, so you will achieve outstanding results. To learn more, contact us at (303) 772-7000.